Time to wake up at 5 AM, breakfast at 5:30, meet Robert at 6 AM and head off to Volcanoes National Park Headquarters. 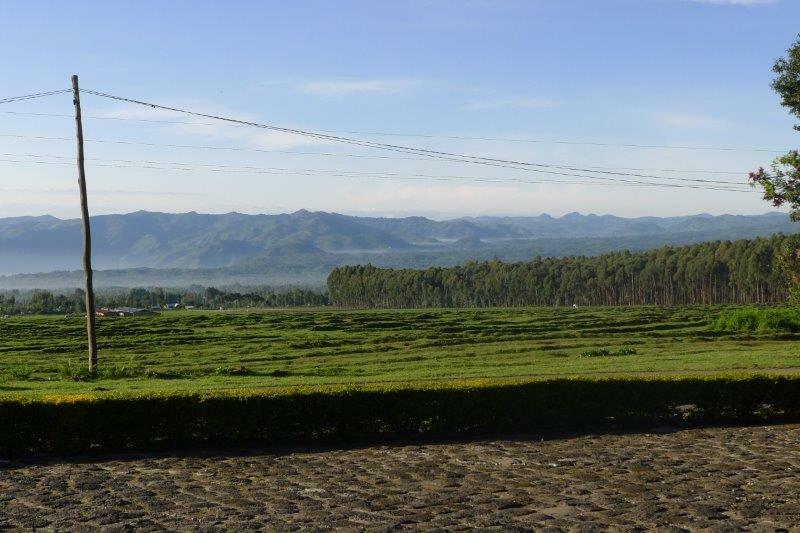 Even if we weren’t going trekking, it was good to see all the activity in the towns in the morning. Adults and children were out and about walking to work or school, taking potatoes, bananas, eggs etc. to market. Taking potatoes to market. 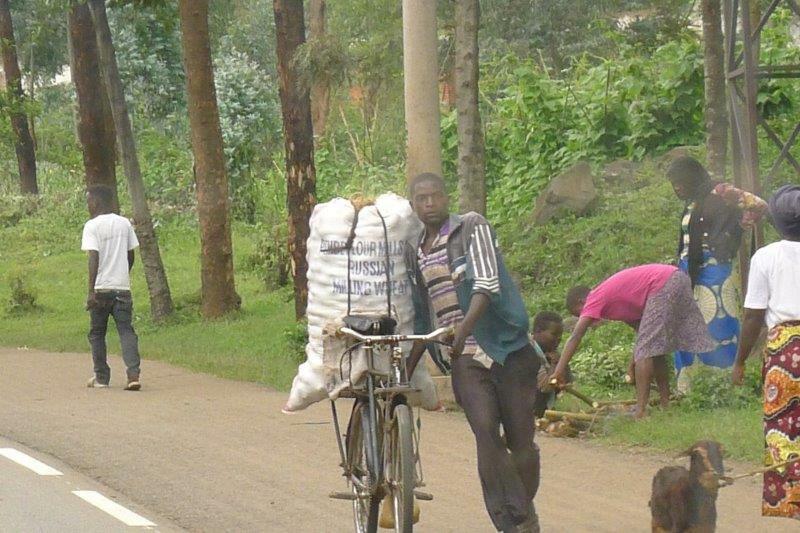 These guys buy potatoes from farmers and use their bicycles to move them up to 25 km. to market. 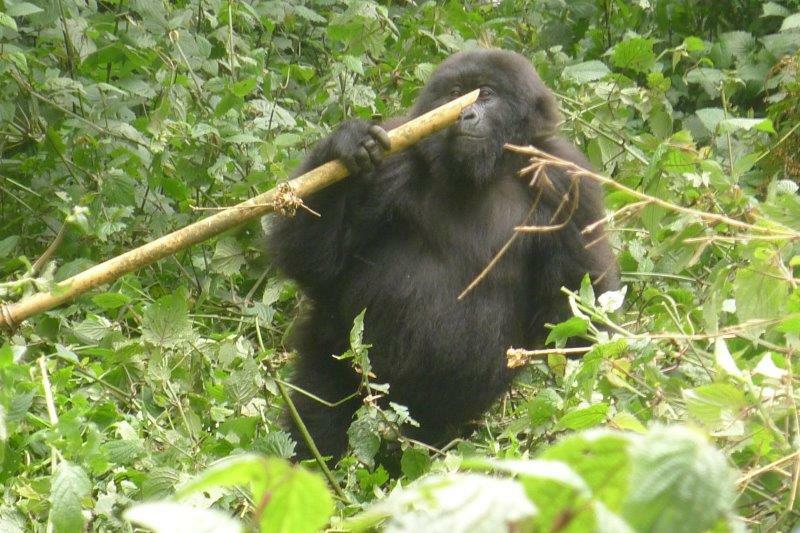 After yesterday, we were very glad we’d booked two treks to have another opportunity to see gorillas. This time we were assigned the Sabinyo group with Big Ben, the bald gorilla; and Guhonda, the oldest Silverback gorilla in the park. 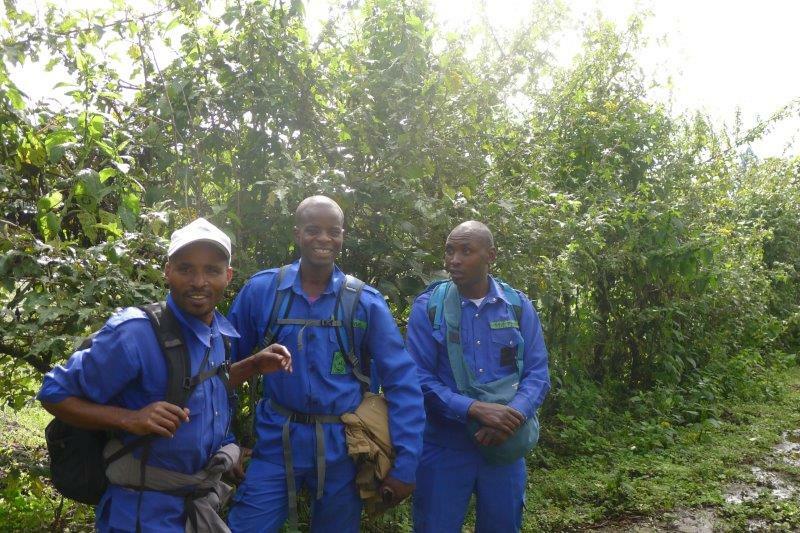 and our trekking guide was Fernando with Placide to help. Fernando made Susan into Queen Susan and Susan and Jane from Australia led the way. No one could go faster than we did. At least people were kind enough to tell us that we were going just fast enough – ie. SLOWLY! 2 Australians – older couple like us! Susan and Mark each hired two porters again and Josse (female) and Andreus were the best for Susan. I think the drivers should do a better job of explaining what the porters can do and the importance of the employment to the economy. 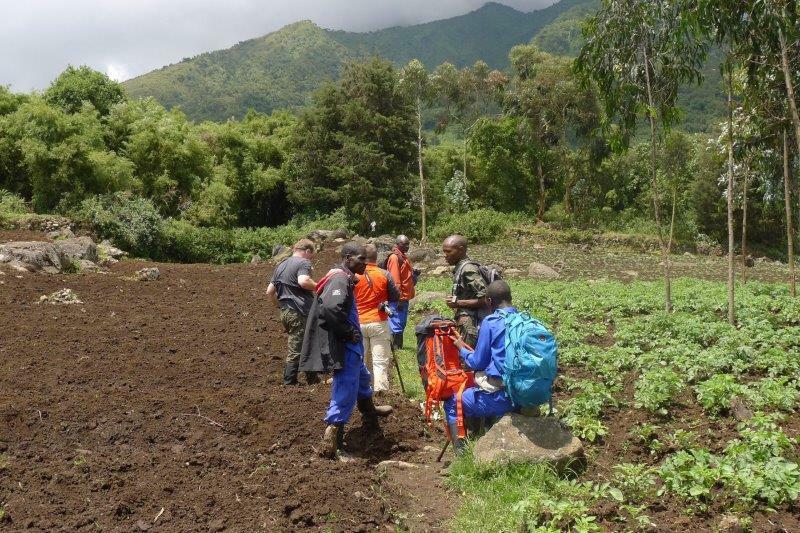 I can testify that their assistance in walking in mud and crossing rocks and little wooden bridges is immeasurable! Today’s walk was much easier than yesterday’s hike, at least on the way up to see the gorillas. We found them after a nice walk through a relatively good trail and only a bit of trekking through cleared brush. Susan must have looked pitiful again because the ranger and trackers helped her through the brush after we left the porters. Our first encounter with a gorilla was to see Big Ben sitting in the middle of the trail as Susan came around a corner. He was easily identifiable as he is noticeably bald on top! He moved a bit off the trail and we all watched him for 5 minutes or so. 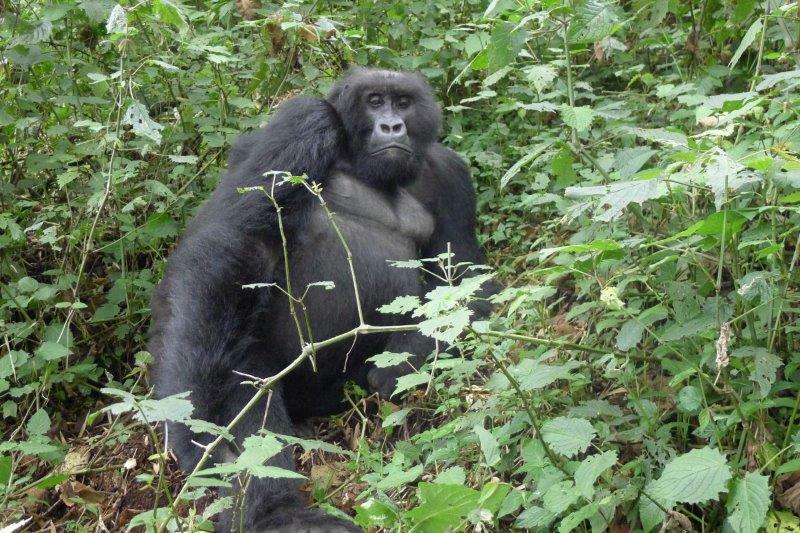 Next encounter was in a clearing with the Silverback wanting to move down the trail. 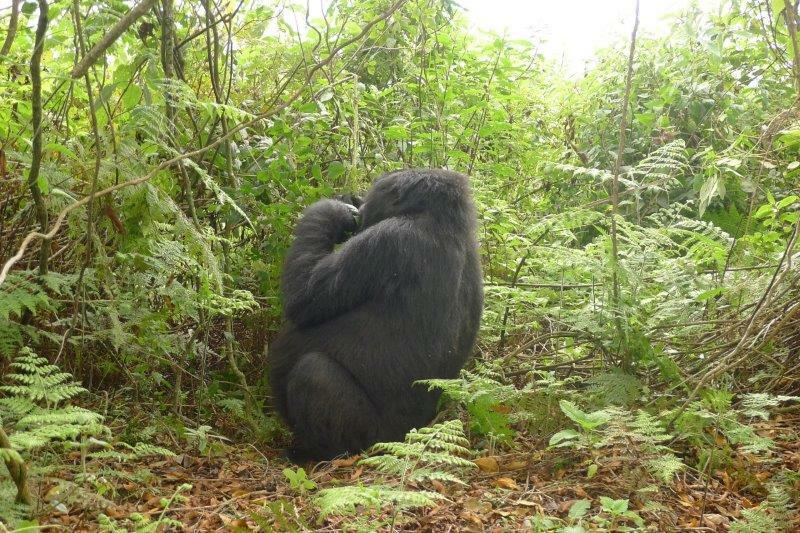 When a silverback wants to move, you move! 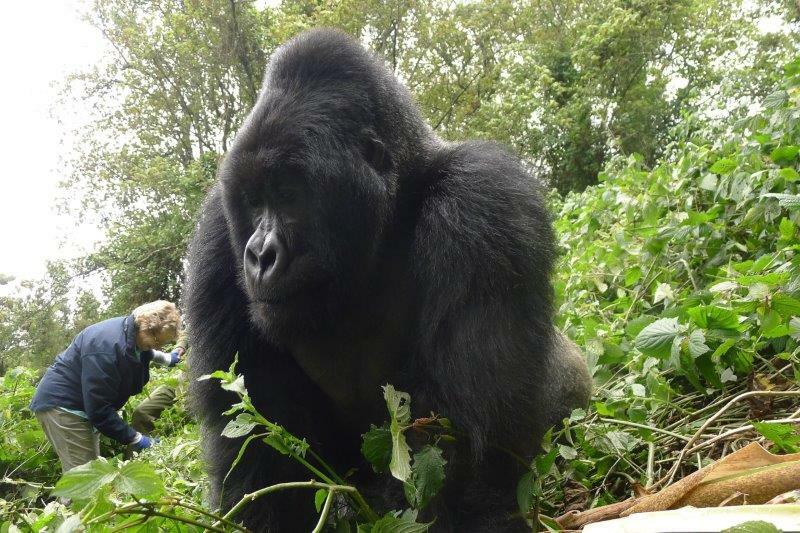 We all cleared the trail but the silverback charged the group as he moved. Another male (teenager) stopped to play with bamboo tree and threw it, hitting the Australian in the knee. Then he rolled down the hill in sommersalts! This silverback gorilla, leader of the family, was every bit as big as he looks here. He walked on the path right in front of Mark. We saw a mom holding on to her baby tightly. This mom and her baby were standing close toe Mark. 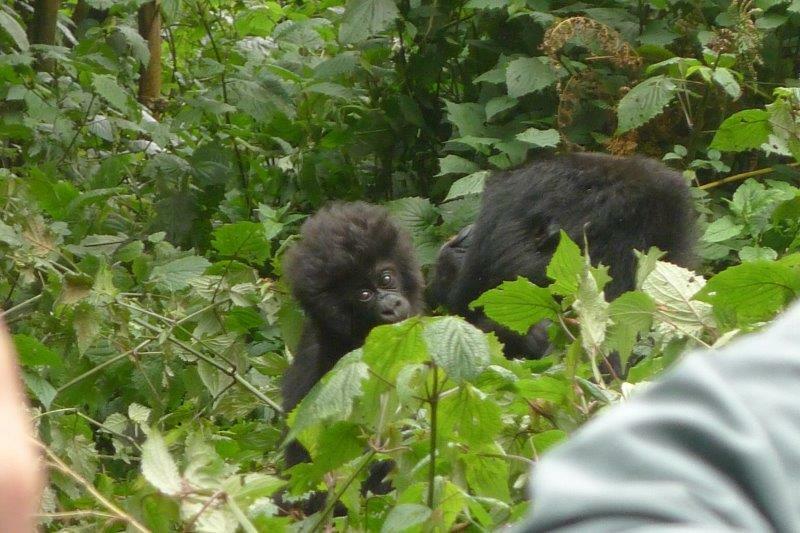 We followed the gorillas for a bit and found some playful little ones. This young one was playing with a stick. This little fellow was enamored with Mark and tried to get closer to his shoes. How could one get any cuter?? Then the rain started, and we learned that gorillas don’t like rain. They all try to find some place to hide and several ended up under a tree’s rout system. The gorillas sat and stared at us! By this time our hour with the Sabinyo family was up and we moved on to trek back to the start. Remember, it rained, right? The rain stopped but now the trail was mud and more mud! Thank heavens for the porters who helped Susan through the mud and held me up when I had to slide down a little hill and helped me up the steps of mud! Mark and I thought the hike was easier than yesterday other than the mud but the MA couple said this was harder than their previous trek. The MA couple only walked 6 minutes the day before because our silverback had chased their silverback and his family out of the park. After the trek Robert stopped at the gift shop for us to get our certificates, use the toilet and buy t-shirts of the family we saw! 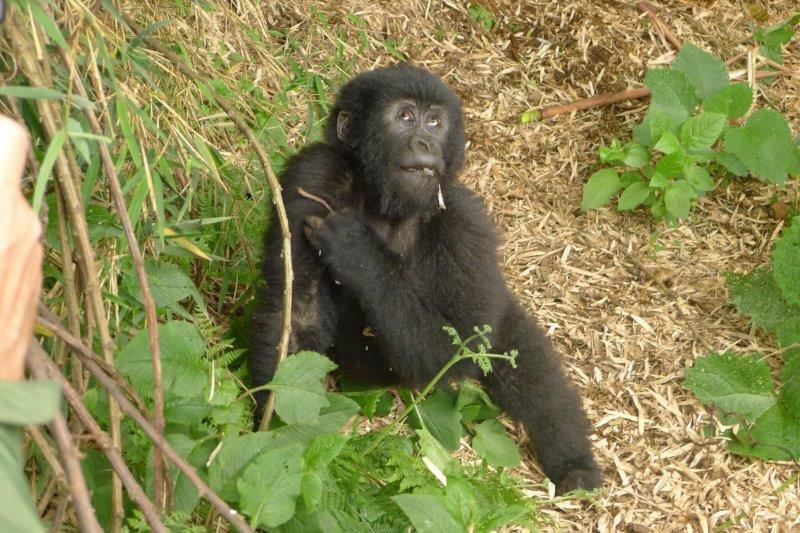 Poor Elie at Virunga Lodge when we got back! He took one look at our hiking boots and knew we’d had a messy hike. He laughed and asked if we wanted a picture of our boots before he cleaned them! 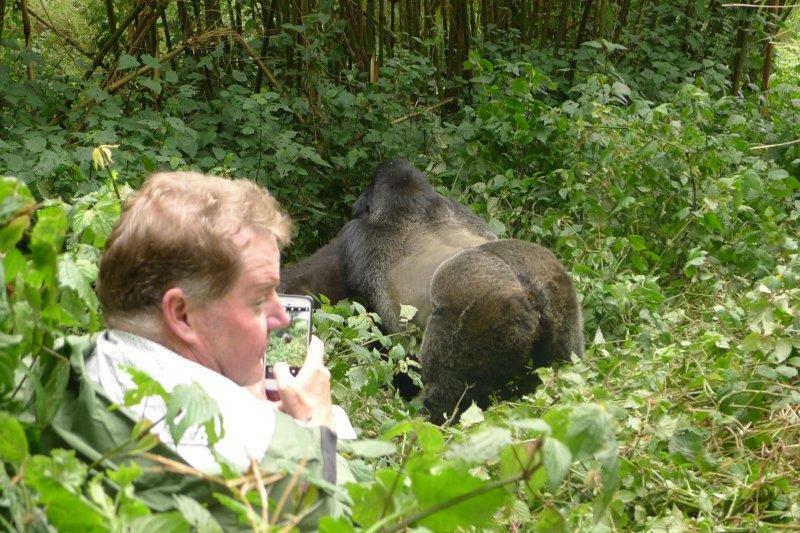 If you ever get a chance to visit Rwanda and the Gorillas do it. Rwanda is a beautiful country and the people are very proud of how clean and safe the country is after the 1994 genocide. We can attest to both as we never saw a piece of trash and we will talk about security at the airport in another post. 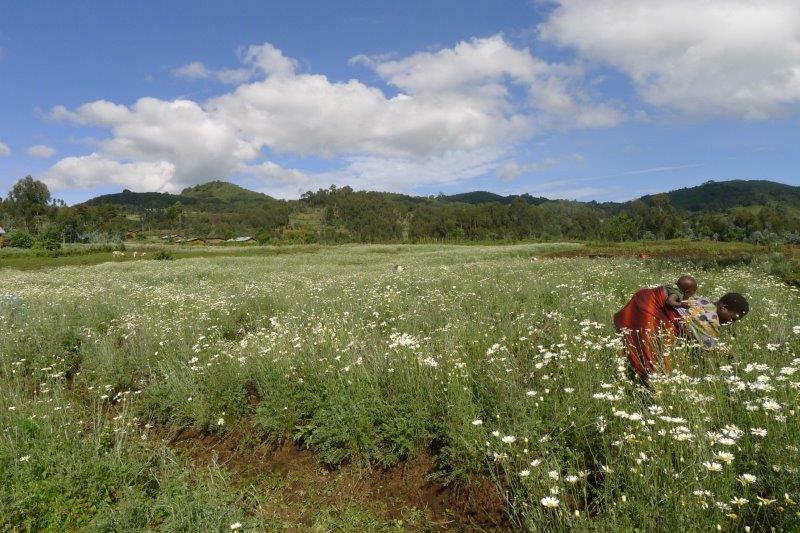 BTW, people are hired in Rwanda to plant flowers, pull weeds, and pick up trash. This isn’t their full-time job; it’s a part time job. The last Saturday in every month is national clean-up day and even the president participates. 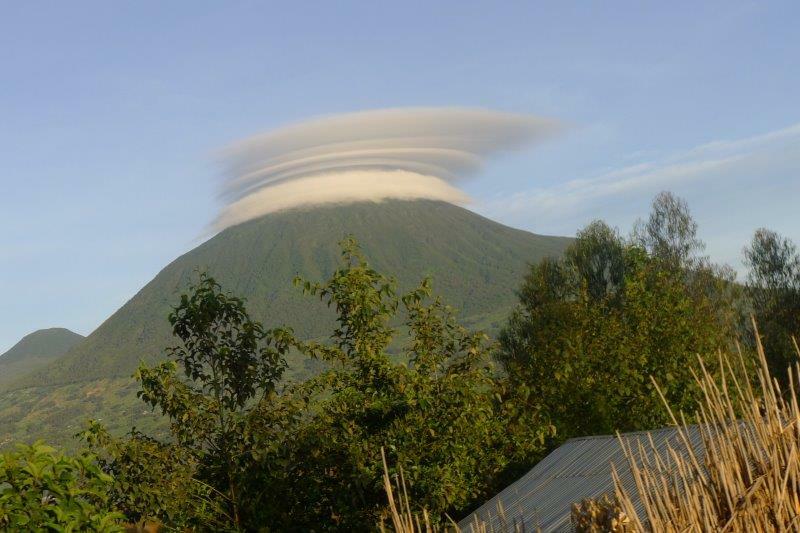 We are in Rwanda to trek with the gorillas, requiring a flight to Rwanda, a visa on arrival at the airport along with $30 US, and a trekking permit for a substantial amount of money. We lucked out because we got our permit about 1 year ahead of time before the permits doubled in price. 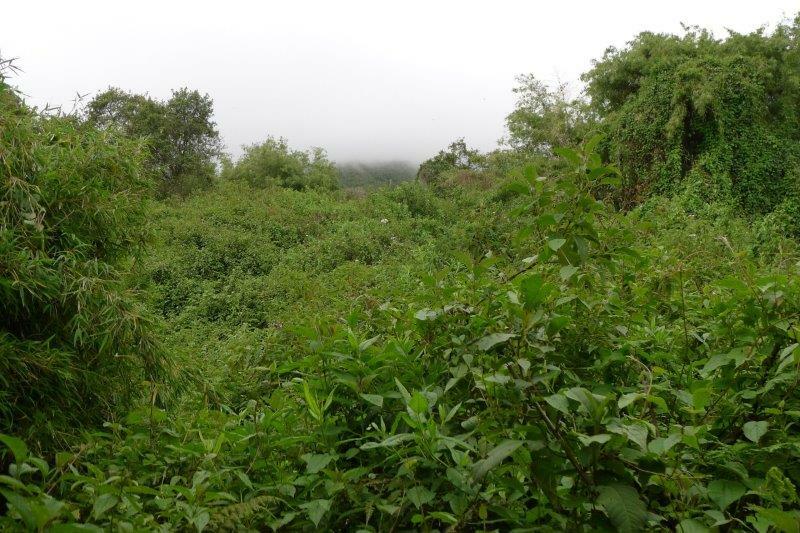 The additional revenue is used to buy land and increase the size of the park/habitat for the gorillas. Up to 12 groups of eight people each can go out in one day to visit the gorillas and permits can be hard to get in the high season. In low season (now) far fewer groups are here. 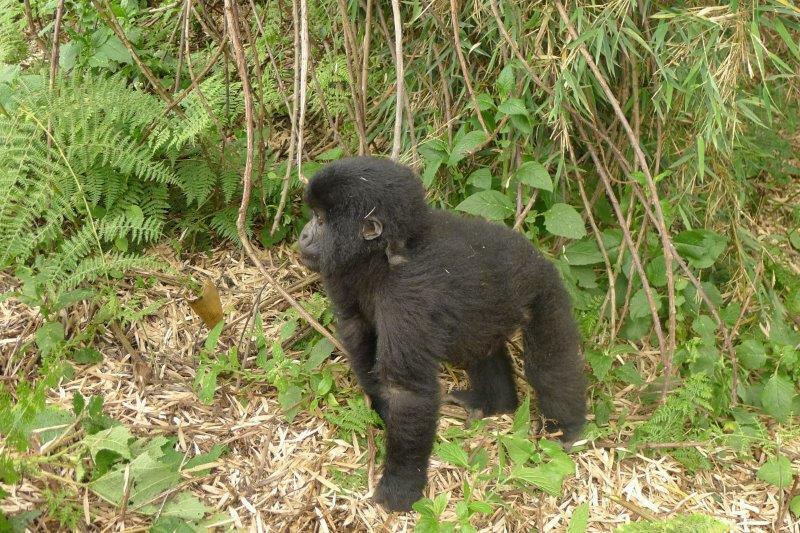 On the day before our first trek, only 2 groups went to visit the gorillas. There are 20 families total in the jungle, but 8 of the families are for research only and no visitors are permitted. 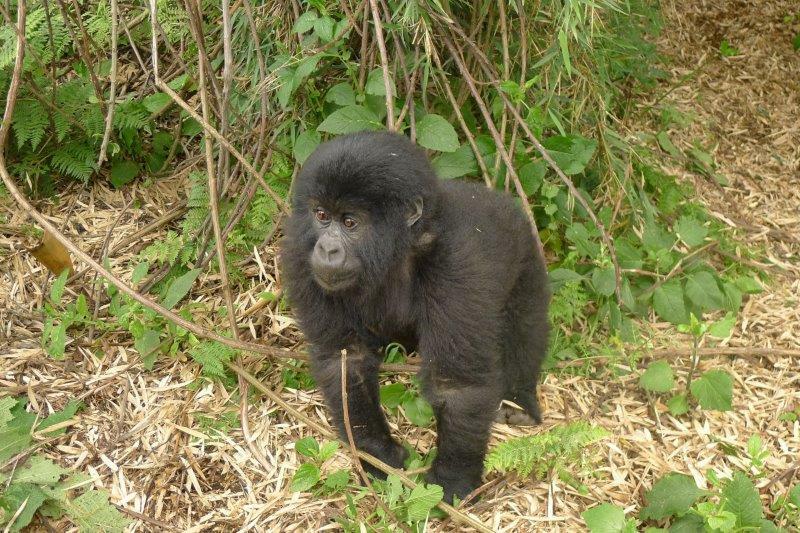 The gorilla trekking in Rwanda is all in Volcanoes National Park on the volcanoes that are shared with Uganda and the Congo. Gorillas can and do move between countries without a passport or a visa. That is a favorite joke of the guides. Not so much for the humans who want to visit them. Check-in time for the visits is 7 AM at Park Headquarters where our driver took copies of our passports to check us in. Everyone checks in here if you are doing the Gorilla Trek, Golden Monkeys trek, or a hike. Before going any further, let me back up a few hours. The 7 AM check-in required us to get up at 5 AM (Yes, it is dark then. ), eat breakfast about 5:30 AM and then go with our driver at 6 AM for the hour drive to the Headquarters. How did we dress for this adventure? Long pants, wool sox pulled up over the pants, hiking boots and gaiters. These are to prevent nettles from sticking to our legs and nasty ants from crawling up legs between the pants and sox if the sox are under the pants (This happened to 3 people on our Golden Monkey Trek.) as well as to collect mud along the way. 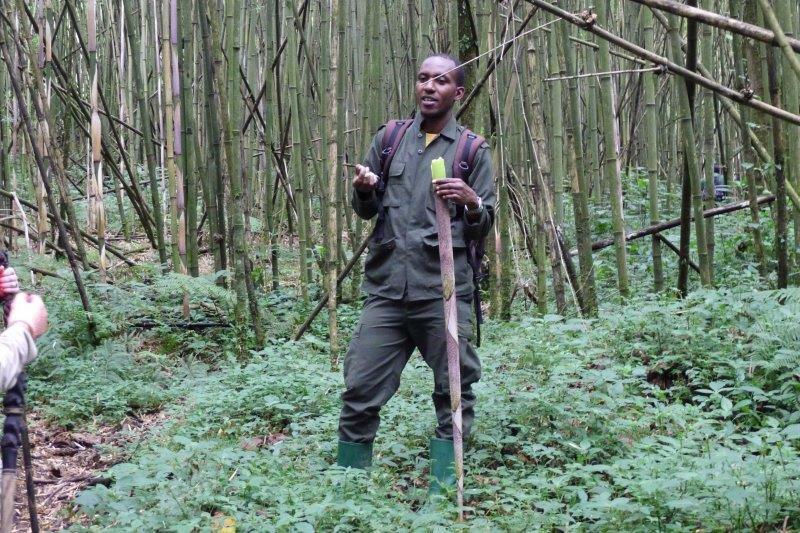 Leather gloves are recommended to protect hands from the nettles and to grab on to bamboo and plants to pull yourself either up the mountain and to help keep you from sliding down the mountain because of the mud. All the literature warned us it could be cold at 8000 feet. 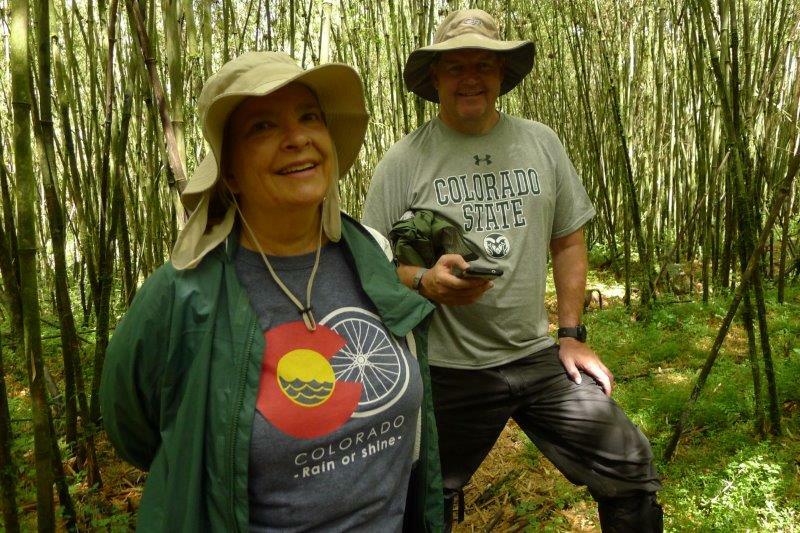 Being good Coloradoans, we had layers with us – t-shirts, mosquito repellent long sleeve shirts and rain jackets – to go with the pants. Did we need them? We wore some combination of these clothes everyday on the hike but not because of the cold. The volcano is a rain forest – think humid – meaning Mark and Susan were never cold but we couldn’t prevent rain and used the rain jackets during the rainfall; we used the long sleeve shirt to save our arms from getting scratched up. It was warm and we hadn’t reached any nettles, so no need for long sleeves yet. Back to check-in … the drivers negotiate with the trekking guides for what kind of hike their customers want – easy, medium, or hard. Robert, our driver, was good and negotiated an easy family for the first day. He seemed to know all the trekking guides which is a good thing! The gorilla group you are assigned is based on the hike difficulty and during high season, it’s tough to get an easy hike. A lot is based on age and even VIP status. It’s low season, making it a bit easier to get the family/hiking difficulty we wanted. After being assigned a gorilla family, the group of eight meets with the trekking guide who is responsible for getting us to the gorillas. 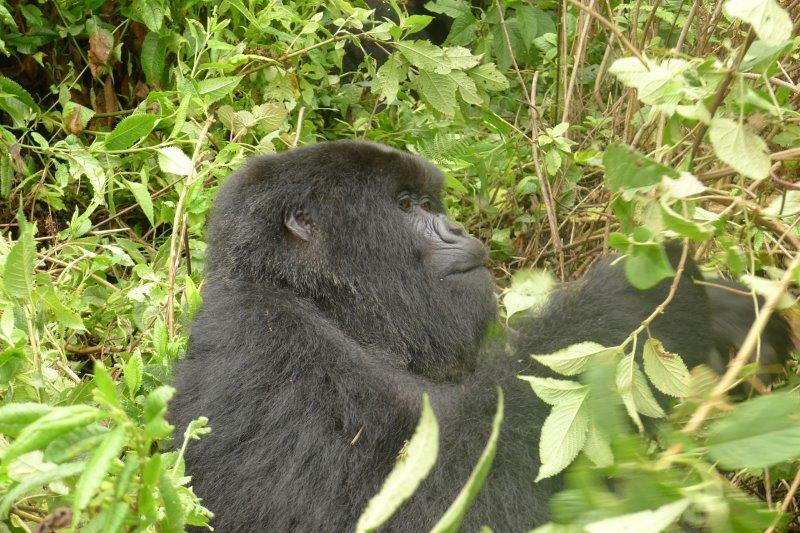 He gave us information about the gorilla family and trekking and we met the other members of the group. Then it’s time for the last visit to the toilets – VERY clean – before heading out with our driver, Robert, to the trek starting point. Each gorilla family has a different starting point requiring a 10 to 30-minute drive to the starting point. At the starting point, everyone gets a walking stick to use if we wanted and we both opted for one. The porters can be hired there, too, and then it’s time to start the walk! About the porters – Porters carry your backpacks which should have bottles of water and some snack food or lunch along with all the clothes you have. They also are amazing at pointing out where to step and helping the visitors up and down stones and steep inclines and muddy trails. These are a few of the porters who helped on the trek. The porters dress in blue with a name and number on each uniform. All of them are either ex-poachers or from a family of poachers with these jobs providing an alternative income to poaching. We were told that the average income for a person in Rwanda per month is only $45. When the trekking group meets the tracker in the forest, you know you are close to the gorilla family and the excitement builds. A side note … our trekking guide on day 1 used his cell phone in addition to the radio. We laughed that cell phone reception is better in the middle of the Rwandan National Park than it is in our house in the middle of Ft. Collins!